Search Engine Optimisation (SEO) is a hugely important part of digital marketing, but is often one of the least understood tools available to a marketing team. On the one hand, the evolving nature of search engine algorithms have meant that the SEO mindset has needed to change quite rapidly, while at the same time SEO practitioners have often made the practice seem like some complicated dark art. This post tries to clear some of this up so we can understand what we should be focused on. As a note on this post, while there are a number of Search Engines out there, I am almost exclusively focusing on Google. It is by far the dominant engine, and represents the biggest opportunity to marketers (at least in the Western world). There is no disputing the impact of Search. It has not only redefined how people find and use the worlds information, it has become so reflexive and essential people would fundamentally struggle to live without it. Ultimately, what is the goal of SEO then? We are simply trying to ensure that the content we have is crawled properly by search engines, and that during this process they understand what our products, services and ideas stand for. They can then hopefully understand that we are the perfect answer for a particular query from a customer. 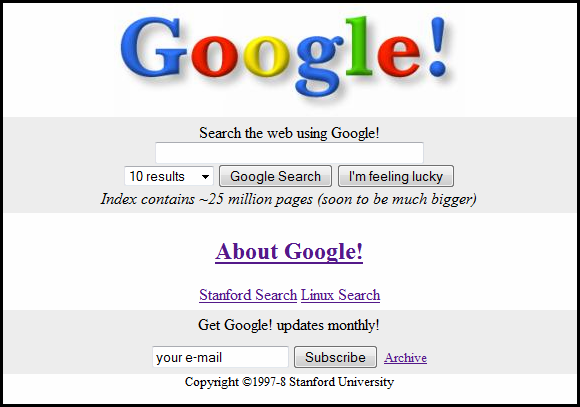 To go a little deeper on this, it is good to go back and review how search engines have ended up where they are today. In the beginning, web search was primarily structured around what we call 'on the page' elements - how many times a specific search keyword appeared on the page. The thought process here was simple, if a page contained a lot of the specific words or terms a person was looking for, then the page with the most was likely the most relevant. The problem that quickly emerged was the first instances of keyword stuffing. Web developers would add thousands of hidden terms on a web page, resulting in a whole lot of irrelevant content being impressed upon users. I still remember cases of businesses stuffing their competitors names across their own sites in the hope of ranking higher than them for their own search terms, hilarious in retrospect. Along came Larry Page and Sergey Brin. The genius innovation they brought to the table was their unique web crawler (now called Googlebot) built around their PageRank algorithm. When web crawlers hit a web page, they scan all of the elements within that page. Traditional crawlers were counting keywords, but Googlebot instead reviewed the amount and type of backlinks connecting to that webpage. A backlink is another website linking to your site. In essence, this was considered an endorsement of your content, and factored in the type of keywords triggering that link (so things like if the meta data was positive). PageRank as the name suggests was also ranking websites in terms of importance, which would in turn factor in the quality of the site linking to you. The best metaphor for this process is to think of it as a handshake. Locking hands with President Obama holds a hell of a lot more sway than a shake with Paris Hilton (and probably guarantees you less chance of getting a virus). So having a highly searched, high quality site linking to your own site should hold sway than some blog written by your creepy nephew from his basement. PageRank completely changed the game for SEO, and led to Google's dominance. But as the web evolved, a new problem started to emerge - the explosion of content and information. This was around the time that news sites went online, and information sharing took off at a rapid pace. The demand emerged for up to the minute real time information. To cater for this, Google introduced what we call universal search. Say I search for 'Magna Carter Holy Grail'. I might be looking for an ancient religious text, but more likely I'm looking for information on Jay-Z. The traditional results started to get blended in with news, video, images, social and other content to add in much more up to the minute relevancy than just long time ranked information. Google's next challenge was to try and make search more semantic - understand search intent, contextual meaning, and use this information to generate more relevant results. Two other big factors also came into play. Firstly, social media took off, resulting in a growth in demand for more vertically focused searching. Second, mobile technology exploded, giving unparalleled access to information at all times, right in your pocket. Semantic search in therefore driven by History, Location and Social Signals. History is about examining what you have searched for previously to factor into your results. Say you repeatedly look at a particular fashion retailer and then do a search for shoes - It is highly likely you will be interested in shoes from that specific fashion site. Or if you have just done a search for travel sites, and then search for New York - there is a good chance you are looking for travel information to New York. History is largely driven by cookies, but things like using the Chrome browser or being logged into your Gmail or G+ account can add layers of semantics to your search results. Location is all about factoring in where you search from. Looking for football in the UK, USA and Australia all have very different local connotations, so Google will factor this into your search results. Or if you search for 'Zoo' in Sydney, you most likely are looking for Taronga Zoo. Social reads the signals coming from social platforms to influence results. By far this is the biggest current influencer on Google PageRank and results, so is very important. Remember backlinks? These were essentially endorsements. Social signals like social sharing are essentially more modern versions of this behaviour. "Wow, I just went to a great restaurant. I'm going to fire up my blog, and write a review. And I'm going to link to the restaurant. And I'm going to make sure there isn't a no follow tag on the post on the platform I'm using. And I'm going to ensure that the hyperlink and surrounding words have positive keywords included"
"That restaurant was great. Like on Facebook!". The next step for Google is building on the notion of semantic search, and to prepare for growth of voice commands (recently this started to roll out as part of their Hummingbird update). This comes through understanding the way conversation applies inference. "give me some pictures of the sydney opera house"
Scenario one is how we have largely been trained to input information using a keyboard. We often abbreviate words to speed things up. Scenario two is a much more human way of conducting a query, and reflects the natural conversations we have with other people. Typing on mobile phones and tablets is more problematic than using a traditional keyboard, so voice ultimately should provide a solution to this behaviour. This is driving scenario two, so Google is doing a lot of work to understand the semantics around language and inference in order to understand commands to drive better relevancy. This means is we are slowly seeing the focus on 'keyword' becoming more of a focus on 'phrase', which means the way we conduct SEO will again need to evolve. Semantic plus context delivers exactly what you need. Now that we have understood the history of Google, Part 2 will look at what exactly we should be focused on right now when it comes to SEO to drive success online.